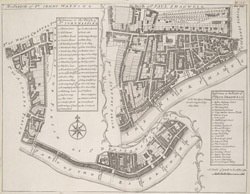 Plan in two sections representing the parishes of St John, Wapping and St Paul's, Shadwell from the 1720 edition of Stow's Survey of the Cities of London and Westminster... published by John Strype. The plan features title along the top, key to streets, courts, churches etc. in both parishes at upper left and lower right, compass at lower left and scale bar at bottom right.